How Can Therapy Animals Benefit Your Facility? Tufts Institute for Human-Animal Interaction can help every facility to have safe and effective visitation by therapy animals from both parties’ perspectives. The Tufts Institute for Human-Animal Interaction (TIHAI) was created to enhance the lives of humans and animals through mutually beneficial interactions. Our mission is to promote the health, strengths, and well-being of humans and animals through transdisciplinary partnerships that foster innovative research, education, and service programs in human-animal interaction. TIHAI has identified that, despite increased enthusiasm for animal-assisted interventions, not all facilities know how to provide safe and effective programs with animals. This manual addresses the needs of these facilities and will guide them to provide enhanced, safe, and effective animal-assisted interventions to create the best environment for the benefits of the human-animal bond. We also provide assistance to facilities looking to start or improve an existing animal-assisted intervention program. Individualized assistance and educational programs beyond the scope of this guide are available for facilities by contacting us at: hai@tufts.edu. 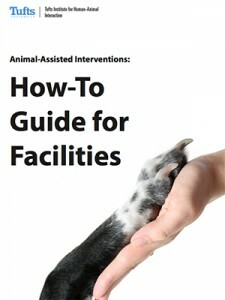 You can download our manual, Animal-Assisted Interventions: How-To Guide for Facilities, for free. Just provide us with a little information and you will get immediate access to the download link.